The nights are getting longer and the days are getting colder and this can only mean one thing – it’s Mushroom season! If you are a regular vegetable buyer you will have spotted them already – strange looking mushrooms in all shapes, sizes and colours. They are in supermarkets, local organic food stores, even in the park! The mushroom is taking over and I couldn’t be happier. The great thing about this season is that it really is unique – only from now until November we will have deliciously different mushrooms in abundance, and then they will all be gone again. I say to hell with the common closed-cap mushroom, let the (relatively short-lived) revolution begin! Up here in Scotland we can definitely feel the cold coming to get us, and that got me thinking about comfort food. I love nothing more than a steaming plateful of something filling to really appreciate the season. 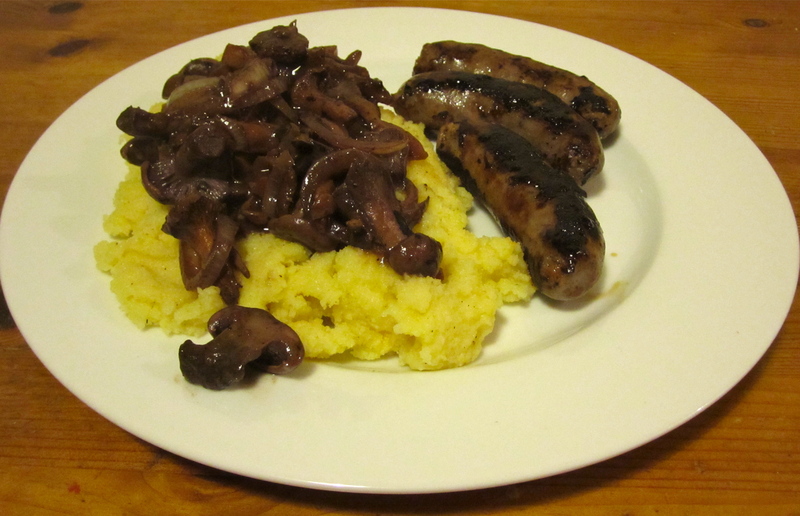 The British are very good at making lovely comforting dishes, and I immediately thought about bangers and mash. But while there is absolutely nothing wrong with that dish, I wanted to make something a bit more special. I realise that even just the name of today’s recipe might be a bit intimidating, but I hope the video will show just how easy it is to prepare this meal. And besides, anything with the words ‘seasonal’ and ‘red wine sauce’ in its description is fancy enough to impress your date! Now, for those who have never tried polenta before, the best way to describe it is ‘corn porridge’. That might not sound incredibly appetising, but polenta is a great substitute for mash, and stunningly versatile. It is made of ground cornmeal, and its preparation traditionally involves hours and hours of stirring. Luckily for us, there is something called ‘instant polenta’ which is just as tasty, and you needn’t stir for more than 5 minutes. Since polenta is in itself quite plain, it is a great vessel for other flavours. It is by far at its best with some Gorgonzola stirred in – the creamy, yet sharp taste of the Gorgonzola melted into polenta is simply divine. Last but not least choose a full-bodied red wine for your sauce as this will go wonderfully with your venison – and stay away from cooking wines! Cook the polenta for between 1-5 minutes, depending on whether you want it soft, like mash, or firm, so that you could cut it with a knife. If you are a fan of polenta, make twice as much and then use the leftovers in some of these tasty recipes! From pan-frying it to sticking it in the oven, there is nothing polenta can’t handle. Mushroom season is upon us but you can’t distinguish an oyster from a morel? Then this website should help! Not only does this site have a wonderful array of pictures of popular mushrooms, it also tells you what you can do with them. And if you’re feeling especially brave, why not go into the woods yourself? This article tells you all about mushroom picking – just make sure you know what you’re cooking!